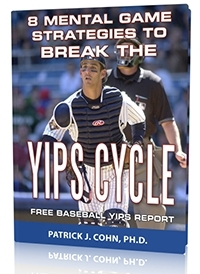 Ssssshhh… Don’t talk about it as if that solution has ever helped any baseball player who is battling the yips. Not talking about the yips means not admitting that it is an issue. Not admitting to the problem of the yips prevents baseball players from seeking solutions. So rather than admitting to having the yips, most baseball players deny its existence and hope it magically disappear. Relate Articles: Are Throwing Problems Caused By The Yips? Jason Giambi, a 20-year veteran, talked about how most baseball players have a “don’t ask-don’t tell” philosophy when it comes to the yips. Garza, a ten-year veteran who was selected in the first-round of the 2005 MLB Draft, has had an issue with the yips when fielding his position. Garza was ALCS MVP in 2008 with the Tampa Bay Rays and, in 2010, pitched a no-hitter. Garza was a powerful pitcher but was a defensive liability due to errant throws and fielding a batted ball. In 2012, opposing teams took advantage of Garza’s throwing yips and bunted on him twice as much as the league average. Former MLB outfielder and teammate, Jason Tyner once commented on pitcher Matt Garza’s experience with the yips. 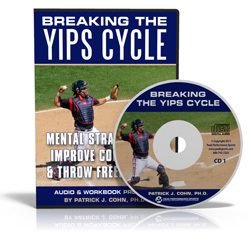 The yips is not some deficiency, it is a mental block… a mental hiccup that interrupts the throwing process. Both the hiccups and the yips involve an involuntary spasm. Both have no obvious cause. Baseball players get in trouble when they field the ball, think about the throw, and then throw the ball. If you focus on the present immersing yourself in the moment where you “field the ball, throw the ball,” you can gradually return to your previous form. Elite track & field hurdlers focus not on the hurdle itself when they run but slightly above the hurdle. The same type of focus can help you beat the mental hurdle of the yips. You need to switch focus from “thinking” mode to “doing” mode. You should practice relaxing and maintaining focus. Before fielding a ball in practice repeat these cue words “Relax-Catch-Throw” after you complete the throw accept the result and move on. Make it a habit to rely on your instincts instead of hoping your ball to the target. 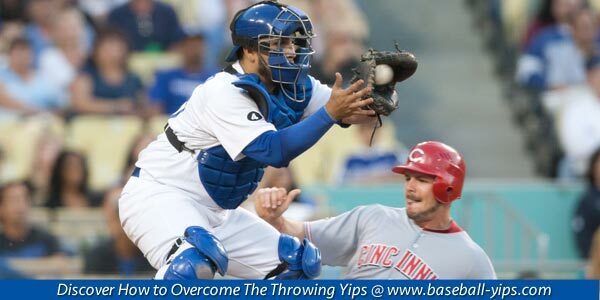 Baseball Throwing Yips Report: Download Now! 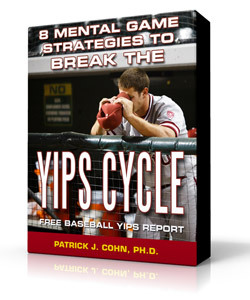 Get Expert Mental Game Coaching & Learn To Beat The Yips!